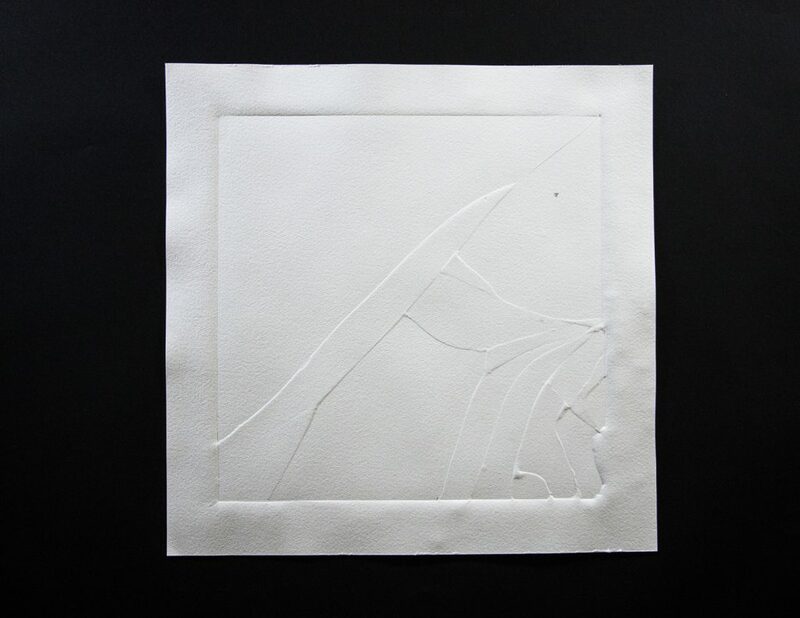 Marília Del Vecchio has been focused on performance from the beginning, dating back to her degree in Communication and Body Arts from PUC-SP and up through her most recent formal experiments, which continue to feature the presence of the body. The thirty-two year-old Joanópolis native is making a name for herself in the São Paulo art world for her investigation into human history through material vestiges using mainly glass, but also ink, bricks, wood and iron. 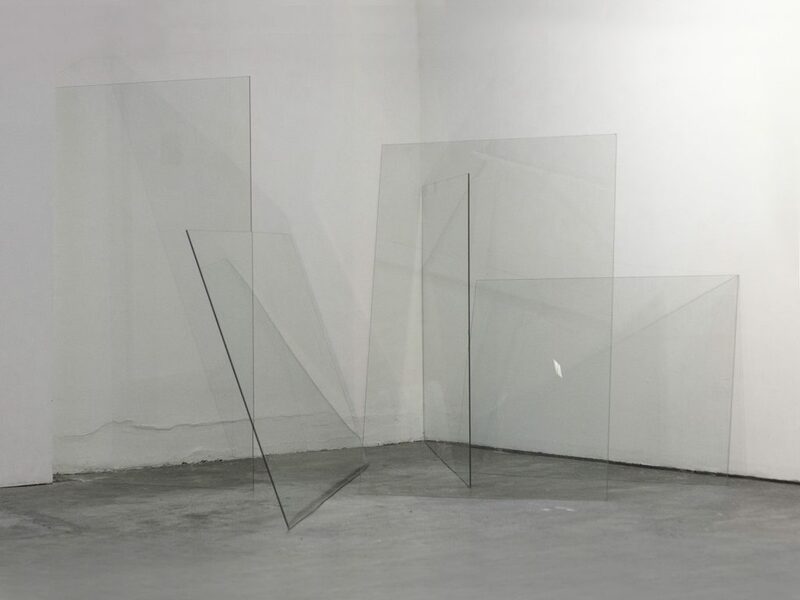 In her new solo at Galeria Virgílio, Del Vecchio presents four artworks in which she strives to join fragile elements to form fleeting unity from mainly Japanese concepts about the duality of emptiness and fecund chaos. 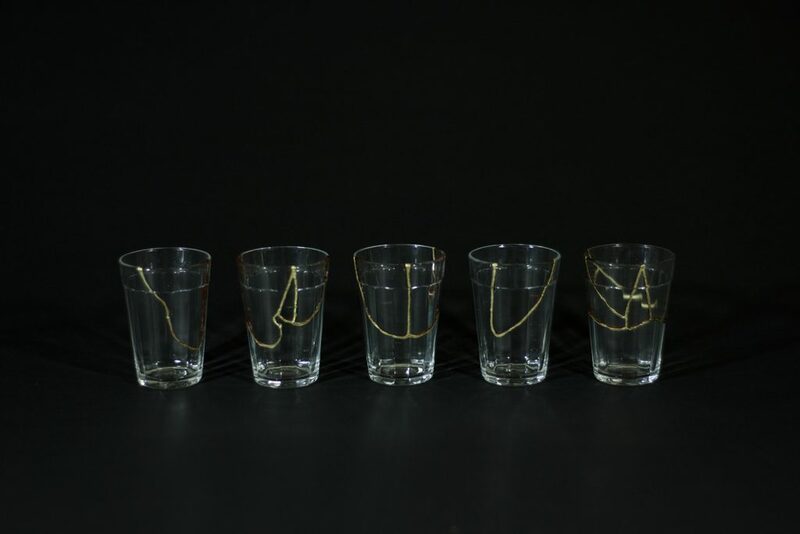 In “Not by great man,” shards of a popular type of cup are reunited through the Japanese technique kintsugi; “História” (History) also joins shards of glass thanks to the pressure of a sheet of paper; “Terra Estrangeira” (Foreign Land) brings the separation of two reunited lovers in the form of a poem and the unstable “Palíndromo” (Palindrome) sculpture—five plates of glass just backed up to one another—can be read in two and three dimensions or even in an immersive form, and in doing so creating a coexistence between drawing, sculpture and the body. When approaching the work, the observer becomes an integral part of it. The beginning of your artistic practice occurred in the field of performance, traces of which can be seen in the physical action you put on the materials you use today. Can you tell us a bit about this trajectory? How did this transition take place? During graduation, my creations in the field of performance focused on external physical actions and how they act under the body. So, for example, I created clothes of different materials directly on my body, making movements in response to the characteristics of the materials used, besides the constant search of the physical limit. The limit-to-body relationship eventually reached its own limit, giving rise to a research into new languages and materials, and I began to look for other ways of communicating without my own body being physically present, but without ceasing the body as a fundamental element during the process of the work creation. Glass is one of the main medias of your work. How is your relationship with the material? An anecdote: when they asked Lawrence of Arabia why he always returned to the desert, he thought a little, and replied “because it is clean.” The answer, of course, cannot be literal; the desert is filthy with scents of people and animals, of earth and sand. What was he talking about then? From a conceptual cleaning, perhaps, to an ideal cleaning but that survives through experience. Likewise with glass and its artistic presentation. The image that the glass reflects is multiple, inconstant and therefore polluted, complex, chaotic. And I find this contrast interesting. Tell me about the work Palíndromo. Like a palindrome, which can be read indifferently from left to right and vice versa, the glass plates that occupy the space can be seen in three-dimensional or two-dimensional form. In the first mode, they occupy space and allow you to enter the middle of the sculpture, making you part of the work; in the second, a drawing is formed on the wall by the use of light. A dialogue between sculpture and drawing is established, allowing the coexistence of the two in the same work. The work Not by great men uses the Japanese pottery-restoration technique kintsugi (gold splice). For the Japanese culture, these pieces are more valued for symbolizing transience and impermanence and not beauty itself. How did you decide on this technique? What does it mean in your research? I learned the technique in a course on Japanese art, where I got in touch with the ideas of Ma and Basara. The duality of an interstitial, of emptiness, which in Zen thought is known as Ma; and the exaggeration, the fecund chaos: Basara. These two concepts and their opposition-interchange appear in several points of my research, as can also be seen in História and in the Palíndromo. Applying this delicate technique to the popular “americano” cup, which has sold six billion units since its inception in 1947, is a way of saying that behind every banal consumer is there a unique story? It’s a way of saying that each one can be unique. It is also a joke with the very notion of kintsugi, with the affectation of “important” porcelain, which is nevertheless a form of marking status, money and power. All of the pieces deal with an effort to put together fragile elements and with the passage of time. Can you comment on this? I do not see it as an effort, but as the interaction between raw materials and fragile situations. Nietzsche defended, through the concept of Amor fati, the unconditional love to all that happens to us, whether through good or bad encounters. Is there anything of the philosopher in your apparent affection for accidents, the cracks of material existence? Fragmented images are formed from an action, even in the Palíndromo, which are rough plates supported by each other, allowing each to see a different image of the other. I cannot determine the outcome of the action or the image that will form, but I can determine that it will happen. Actions lead to reactions, the crack mark there was an action, a story. I do not think in terms of affection or love, but of marking the passage of time, without emotional, positive or negative relations. In Not great men, História and Terra Estrangeira (a Pushkin poem in Russian), the identification of the senses remain almost hidden until the moment when one reads about their processes and their translation, in the case of the latter, in the exhibition’s catalog. Do you consider your practice conceptual? Is there an intention to impose a small barrier that demands the observer cross it? 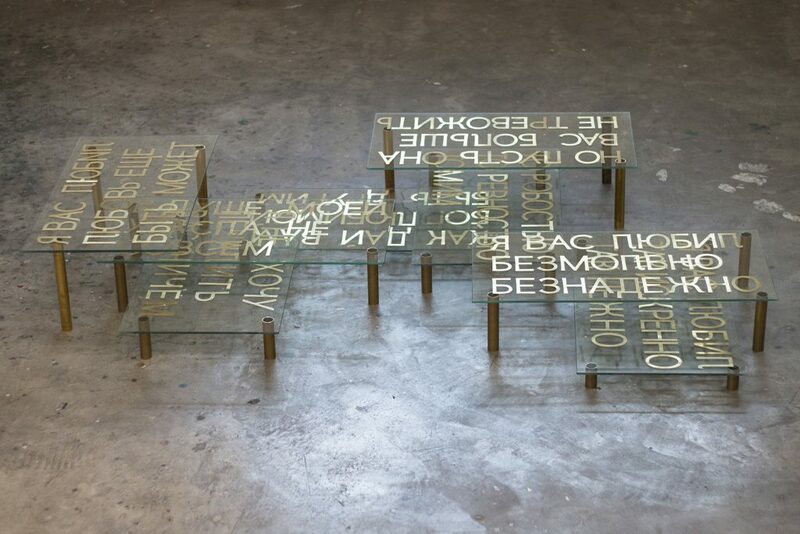 In Terra Estrangeira, what you see are in front of you: the confusion of the images that are mixed, the inability to read what is written, that even if you know Russian, the words mingle in each other. The work’s idea is a material form of something that is in front of you, but which you do not access directly. But I do not think, neither there nor in the others, that this is the imposition of a barrier. The poem is translated in the catalog, as there are in the texts of the catalog, in the titles themselves, clues to the understanding of the other works. Thais Gouveia (1984) is half Brazilian, half Portuguese independent curator and art writer based in São Paulo. She has written for many national and international tittles including ArtReview, Newcity Brazil, Arte!Brasileiros, This is Tomorrow, DasArtes and Entretempos of Folha de São Paulo and curated solo and group shows at Fauna Gallery, Zipper Gallery, Casa Nova Gallery and Casa Plana. A graduate in Art and Technology at PUC, Brazil, Gouveia studied art criticism at Central St Martins University of the Arts, London and worked as institutional and communications coordinator at ICCo (Instituto de Cultura Contemporânea), communications and content manager at Baró Gallery, communications assistant at David Roberts Art Foundation and as photo dditor at Lola Magazine and Rolling Stone Brazil.